International Studies honours student, Thembile Ndlovu, was selected by Laureate Education to attend the Clinton Global Initiative University (CGI U) conference from March 21-23, 2014 in Phoenix, Arizona. Thembile was chosen because of her record of academic excellence and involvement in a community initiative. Every year, the Clinton Global Initiative University hosts a conference that brings together young leaders, organisations and experts where discussions about global challenges take place. As a prerequisite to attending the event, delegates need to develop their own practical solutions to solve global issues, focusing on any of CGI U’s five core areas: education, environment and climate change, peace and human rights, poverty alleviation and public health. “At Monash South Africa, I have the privilege of working with some of the most innovative and dynamic young people in the world. My goal is to encourage and support them as they lead the positive change in every sector of society. Thembile is one of the world-changers who are clearly making a difference,” said Craig Rowe, Monash South Africa’s community engagement manager. Thembile’s commitment to action is called Authentic Chicks Talk (ACT) which is a series of facilitated dialogue sessions designed to empower young girls from impoverished communities. ACT provides a platform for the young girls that are restricted by cultural stigma and norms, to voice out their opinions and be heard. The dialogue sessions will be held monthly in local communities and in partnership with the high schools in those communities. The initiative aims to take a group of 50 girls through a programme that will include a curriculum on self-empowerment, health, relationships and career guidance. “Connecting and networking with all the other students that were at the conference, I realised that there is a global need for a platform for women to be heard. I realised that what I thought was a local issue was actually global. My project is not just a need within my region, but it is a global need as well,” said Thembile whose favourite part about the event was the live streamed plenary sessions that people all over the globe could participate in through social media. 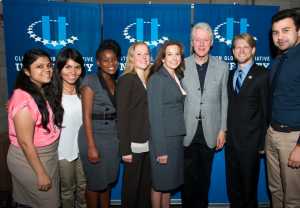 Students attending the Clinton Global Initiative University conference, with the support of their respective universities, have made a difference in the communities around them. Laureate has sent a student delegation to CGI U since 2012 and this year, sent a team of seven international students to the event, all who committed to turning their innovative ideas into actions that would help their local communities. Article issued by Monash South Africa. To view their profile on SAstudy, click here.